Place the chile, unpeeled garlic and onion slice on a pre-heated comal or skillet set over medium heat, or place under the broiler on a sheet pan. Char or roast for about 10 minutes, flipping occasionally so they char evenly, until blackened. Remove from heat and set aside to cool. When cool enough to handle, peel the garlic and cut the stem from the chile. Coarsely chop, chile, garlic and onion. Place in bowl or molcajete, along with the lime juice and salt, and mash or mix until pasty. 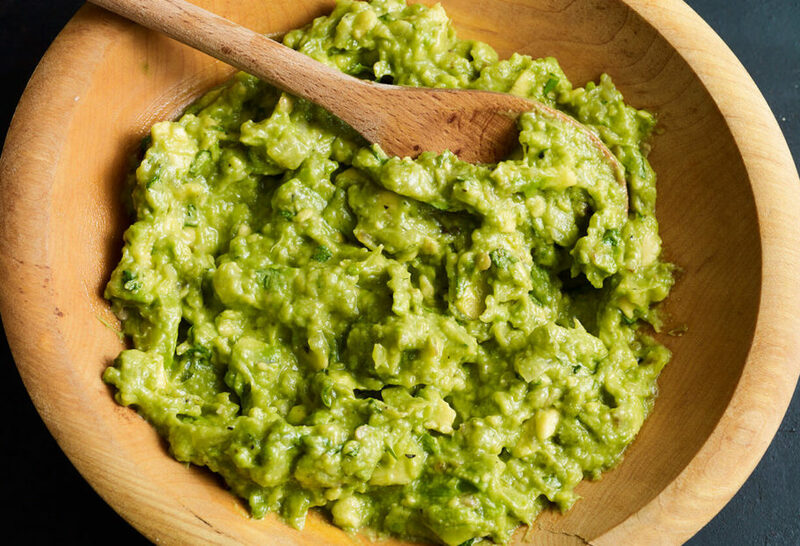 Incorporate the cilantro and avocados, and mash until you reach your desired consistency (I like it chunky). Done! Making this along with your spinning top cocktail for a 4th of July BBQ. Also using my molcajete for the first time!! My husband and I love the show and all of the wonderful recipes, thank you! Have fun using your molcajete for the first time…and many many more times, Kristina! Giving this a try for a barbecue with friends. I love your show and think you are fantastic! This will be great for a BBQ…have a great time, Bethany! I’m going to make this for a birthday party Saturday night. Makes my mouth water thinking about it. I always enjoy your program on PBS, keep up the great work. Have a great party, Richard! Just made this , delicioso!! !